When big name movie actors agree to appear in a television series, it tends to attract attention. Of course in the days of strictly network TV, such an announcement would normally mean the beginning of the end for that actor's career. But these days with the advance of pay TV networks and the drive for such channels to create their own original content, it's not necessarily a bad thing when an actor goes to the small screen. And this is especially true when it comes to HBO productions, it seems. 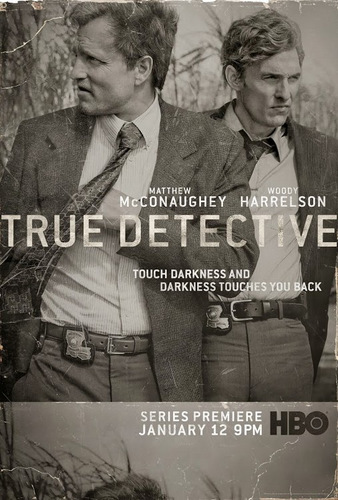 When True Detective first came out, a lot of people were in a rush to classify the show somehow and make it easier for other people (like myself, admittedly) to figure out if this was something worth getting into. And on the surface, yet another crime drama didn't seem all that compelling. But one thing led to another and more and more folks were ranting and raving about how complex the narrative was and how fulfilling the plot development appeared to be. So I got curious enough to try and invest more time in the show despite my challenges with figuring out what Matthew McConaughey was trying to say in most of scenes. And in the end, I think the show was pretty decent, but I don't quite get why some people were so crazy over it. Synopsis: True Detective is a crime drama television series created by Nic Pizzolatto for HBO. The series was directed by Cary Joji Fukunaga. In 2012, police detectives Martin Hart (Woody Harrelson) and Rustin Cohle (Matthew McConaughey) are being interviewed separately by detectives Thomas Papania (Tory Kittles) and Maynard Gilbough (Michael Potts). The subject of their investigation is the Dora Kelly Lange case that took place 17 years before in 1995. The show cuts back and forth between 2012 and 1995 as we follow the questioning and also get to see the events of that mysterious case. As we learn more about the murders and the disappearances in 1995, we also learn that Hart and Cohle had a falling out sometime in 2002. Thus the reason why the two are being interviewed separately as well - to see if one will reveal something of interest about the other. As the series progresses, we eventually follow things back to that time period to see just how the two men got into their present status. At the core of the investigation in the present is the possibility that another murder has happened in the style of the Dora Kelly Lange murder - which should have been impossible since Hart and Cohle had claimed to have caught the killer back in 1995. Call me evil, but I hate it when Matthew McConaughey mumbles. He's a charming enough fellow and I know he has quite the following, but he's almost unintelligible when he mumbles. And for one reason or another, it seems he figured that the best way to convey how brooding and introspective his character is was by having him speak in a very low register that really is a horrible mumble. And given how much of the show is focused on the one-on-one interviews of Hart and Cohle, that means a lot of scenes where my brain seems to tune out just as he's trying to convey important information about the plot. At first there were elements in the story that were rather intriguing to me. We had the Reverend Billy Lee Tuttle (Jay O. Sanders) and his strange little congregation being somehow tied to the murders. We had references to Lovecraftian elements such as the "King in Yellow". And we had those little wood sculptures that were oddly reminiscent of The Blairwitch Project. These somewhat supernatural elements to the story certainly appealed to me on a genre fiction level, but in the end they really didn't lead anywhere. Whether they were intentionally meant as red herrings or just got lost in the shuffle as new plot ideas came to the fore, the show has a lot of loose ends. The characters were certainly richly complex and it was nice to explore their respective back stories. Of course we didn't quite go through each character's back story in strictly chronological order, providing a pretty rich narrative experience as things went back and forth. And I do enjoy that sort of storytelling when done well - and when I can understand what the people are saying. I wonder if True Detective would have worked more for me had they not cast two prominent actors in the lead roles. To make matters worse, we've seen Harrelson and McConaughey in many movies together, most of them being comedies. And that lingering impression of the two actors can be a bit of a distraction in trying to appreciate the more serious tone of this series. There were just so many things going on that sort of got in the way of appreciating this show. We actually had to watch the first few episodes more than once just to get into the flow of things - which is kind of sad for an 8-episode series. For all the dramatic build-up though, the ending felt rather underwhelming, I have to admit. There was all this going and fro in the different time periods of the story, but in the end the story ended on a bit of a whimper. Sure there was a big climactic struggle and all that, but somehow the final reveal of who was responsible for the murders didn't feel quite as fulfilling given all that had come before. And with luck they'll have a stronger story to tell should this get renewed for a second season - and the claims are that it is planned out as an anthology series with a completely different primary cast. True Detective is a good show, but it didn't quit strike me as great as I had hoped (or as people tried to convince me so). This may just be a matter of opinion more than anything else - I can certainly see different aspects of the show that were very promising and certainly provided decent reason to watch the show all the way to the end. Thus this first season gets a decent 3 potentially interesting attributes of our mysterious serial killer out of a possible 5.